Although installing an LVT or LVP floor is possible as a DIY project, it can be tricky so we recommend hiring a professional who is experienced and qualified to install this type of flooring. Installing vinyl flooring can be done over most surfaces as long as those surfaces are smooth. Any rough and uneven spots will eventually protrude or show through the new flooring, causing noticeable high spots that will wear faster than the rest of the floor. 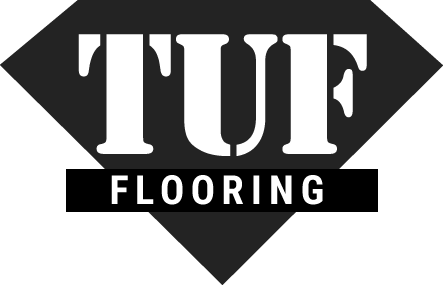 Our trusted flooring specialists at TUF Flooring have put together some important guidelines and steps when it comes to installing your new luxury vinyl floor. Here is what you can expect for a LVT or LVP installation. A few days before, the new vinyl plank or tile flooring will be placed in the room for acclimation. Specialized tools and materials needed for this installation include a crowbar, level, chalk line, the vinyl flooring and the surface preparation. The first step is removal of the baseboards. Next, the subfloor will need to be thoroughly prepared so that it is flat, smooth and dry. A self-leveler can be used on low spots while high spots of wood or concrete can be sanded. Next, the center of each wall, as well as snap lines, need to be marked with chalk and measurements will be taken to determine where the flooring should be placed. If the flooring has adhesive backing it can simply be stuck to the floor, while other brands will snap together. Afterwards all the finishing touches will be completed such as replacing the baseboards. The bulkiness and weight of the vinyl sheet roll along with the challenge of cutting it perfectly to size, can make correctly installing this type of flooring a difficult and complex job. While we recommend using a professional installer, it is possible to be done as a DIY job if you have the knowledge and experience for the task. The installation process begins by clearing out all the furniture and anything else in the room, removing and disposing of the current floor if relevant, and taking down any wall base, millwork or trim. Next, the subfloor is prepared. It needs to be dry, clean, smooth and flat so later on nothing protrudes or shows through the vinyl. The installation will require various tools and supplies including adhesive, double-faced flooring tape, a vinyl cutting knife, a 100 lb. roller and other tools. Next comes the vinyl sheet flooring. The flooring may need either a very short time or a slightly longer time to acclimate to your home’s temperature, depending on the brand. Installation instructions will also vary depending on the type of vinyl sheet floor selected. For a proper installation, close attention needs to be paid to the subfloor requirements, the seams, and the cutting and fitting methods for the vinyl sheet.